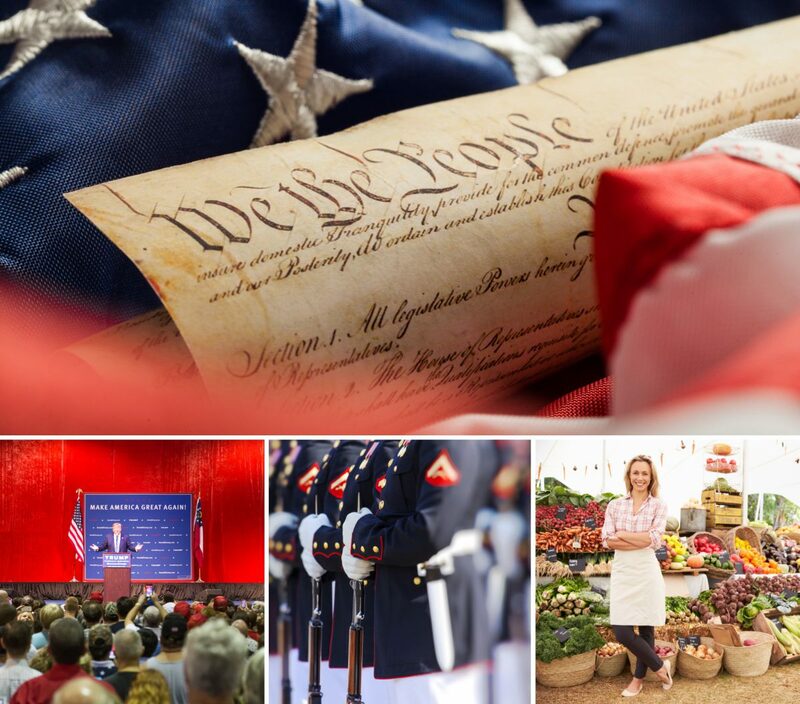 Republicans for Security, Opportunity, Liberty and Victory that Endures. “For centuries,” writes our frequent RESOLVE contributor Walter B. Bull Jr., “rapid radical change has been designated as a sea-change.” In fact, William Shakespeare used the phrase as long ago as 1610 when penning a lyric. American society is witnessing a dramatic sea-change that has been intensified by the election of President Donald Trump and the mainstream media’s intent to derail, if not end, his presidency. But the change, writes Bull, began toward the end of the previous century. Radio and television changed the way we experienced historic, including tragic, events, such as the assassinations of President John F. Kennedy and presidential candidate Robert F. Kennedy, the Vietnam War, the space shuttle Challenger’s mid-air explosion and, most chillingly, Sept. 11, 2001. The sea change playing out before us as 2018 begins is driven by two forces working in lockstep. The Democrat Party, now completely devoid of moderates, is lurching further and further into a state of frothing-at-the-mouth, radical progressivism. And the mainstream media, of similar mindset, questions nothing and gleefully advances the agenda. These two camps, so obsessed with diminishing Trump, seem no longer to care they are diminishing themselves. The FBI and Justice Department, as evidenced by the existence of the phony “Steele dossier”, apparently are not afraid of being diminished, as well. No single news story demonstrates the impact of the media-fueled Democrat agenda to obstruct Trump and the Republican Congressional majority more than the passage of tax cuts at year’s end. The media’s forecast on corporate and household tax cuts looked like this: Tax-Reform Bill is Unpopular Because Media Mislead Americans (National Review, Dec. 20, 2017). It’s very clear that the tax bill passed by both the House and Senate (Dec. 19) is indisputably unpopular among Americans. But the reasons for that unpopularity are much less clear. Left-wing bias in the media likely has a lot to do with it. National Review further pointed out that formerly reliable wire service Associated Press reported passage of the bill via Twitter as providing “steep tax cuts for businesses, the wealthy”. Talking points, not journalism. As we move into mid-January, about a month after the bill’s passage, most media outlets are straining to avoid almost daily evidence that tax cuts for businesses are having the effect Republicans forecast all along (even as polls reflected a skeptical public). Thankfully, the Washington Examiner shared what its reporters learned when they reviewed a meticulous bit of tallying by Americans for Tax Reform. A list of 40 firms offering millions of employees bonuses and customers fee cuts has surged to 164 in just 10 days as the likely financial benefit of President Trump’s tax reform has started to settle in. Perhaps, retorts the media’s mainstreamers, adrift in their turbulent sea. On to other narratives they turn even as Americans rejoice in economic liberation. Trump is a racist, an insane one at that. And, of course, Russia, Russia, Russia. The Washington Examiner unwrapped an early Christmas present today, publishing a list of 81 major victories by the Trump administration in 12 categories since President Donald Trump was inaugurated last January 20. Passage of the tax reform bill providing $5.5 billion in cuts and repealing the Obamacare mandate. Increase of the GDP above 3 percent. Creation of 1.7 million new jobs, cutting unemployment to 4.1 percent. Saw the Dow Jones reach record highs. A rebound in economic confidence to a 17-year high. A new executive order to boost apprenticeships. A move to boost computer sciences in Education Department programs. Prioritizing women-owned businesses for some $500 million in SBA loans. Signed an Executive Order demanding that two regulations be killed for every new one creates. He beat that big and cut 16 rules and regulations for every one created, saving $8.1 billion. Signed 15 congressional regulatory cuts. Withdrew from the Obama-era Paris Climate Agreement, ending the threat of environmental regulations. Signed an Executive Order cutting the time for infrastructure permit approvals. Eliminated an Obama rule on streams that Trump felt unfairly targeted the coal industry. Made good on his campaign promise to withdraw from the Trans-Pacific Partnership. Opened up the North American Free Trade Agreement for talks to better the deal for the U.S. Worked to bring companies back to the U.S., and companies like Toyota, Mazda, Broadcom Limited, and Foxconn announced plans to open U.S. plants. Worked to promote the sale of U.S products abroad. Made enforcement of U.S. trade laws, especially those that involve national security, a priority. Ended Obama’s deal with Cuba. The Department of Interior, which has led the way in cutting regulations, opened plans to lease 77 million acres in the Gulf of Mexico for oil and gas drilling. Trump traveled the world to promote the sale and use of U.S. energy. Expanded energy infrastructure projects like the Keystone XL Pipeline snubbed by Obama. Ordered the Environmental Protection Agency to kill Obama’s Clean Power Plan. EPA is reconsidering Obama rules on methane emissions. Laid out new principles for reforming immigration and announced plan to end “chain migration,” which lets one legal immigrant to bring in dozens of family members. Made progress to build the border wall with Mexico. Ended the Obama-era “catch and release” of illegal immigrants. Boosted the arrests of illegals inside the U.S.
Doubled the number of counties participating with Immigration and Customs Enforcement charged with deporting illegals. Removed 36 percent more criminal gang members than in fiscal 2016. Started the end of the Deferred Action for Childhood Arrival program. Ditto for other amnesty programs like Deferred Action for Parents of Americans. Cracking down on some 300 sanctuary cities that defy ICE but still get federal dollars. Added some 100 new immigration judges. Justice announced grants of $98 million to fund 802 new cops. Justice worked with Central American nations to arrest and charge 4,000 MS-13 members. Homeland rounded up nearly 800 MS-13 members, an 83 percent one-year increase. Signed three executive orders aimed at cracking down on international criminal organizations. Attorney General Jeff Sessions created new National Public Safety Partnership, a cooperative initiative with cities to reduce violent crimes. Trump has nominated 73 federal judges and won his nomination of Neil Gorsuch to the Supreme Court. Ordered ethical standards including a lobbying ban. Called for a comprehensive plan to reorganize the executive branch. Ordered an overhaul to modernize the digital government. Called for a full audit of the Pentagon and its spending. First, the president declared a Nationwide Public Health Emergency on opioids. His Council of Economic Advisors played a role in determining that overdoses are underreported by as much as 24 percent. The Department of Health and Human Services laid out a new five-point strategy to fight the crisis. Justice announced it was scheduling fentanyl substances as a drug class under the Controlled Substances Act. Justice started a fraud crackdown, arresting more than 400. The administration added $500 million to fight the crisis. On National Drug Take Back Day, the Drug Enforcement Agency collected 456 tons. In his first week, Trump reinstated and expanded the Mexico City Policy that blocks some $9 billion in foreign aid being used for abortions. Worked with Congress on a bill overturning an Obama regulation that blocked states from defunding abortion providers. Published guidance to block Obamacare money from supporting abortion. Signed the Veterans Accountability and Whistleblower Protection Act to allow senior officials in the Department of Veterans Affairs to fire failing employees and establish safeguards to protect whistleblowers. Signed the Veterans Appeals Improvement and Modernization Act. Signed the Harry W. Colmery Veterans Educational Assistance Act, to provide support. Signed the VA Choice and Quality Employment Act of 2017 to authorize $2.1 billion in additional funds for the Veterans Choice Program. Had the VA launch an online “Access and Quality Tool,” providing veterans with a way to access wait time and quality of care data. With VA Secretary Dr. David Shulkin, announced three initiatives to expand access to healthcare for veterans using telehealth technology. Directed the rebuilding of the military and ordered a new national strategy and nuclear posture review. Worked to increase defense spending. Empowered military leaders to “seize the initiative and win,” reducing the need for a White House sign off on every mission. Directed the revival of the National Space Council to develop space war strategies. Elevated U.S. Cyber Command into a major warfighting command. Withdrew from the U.N. Global Compact on Migration, which Trump saw as a threat to borders. Imposed a travel ban on nations that lack border and anti-terrorism security. Saw ISIS lose virtually all of its territory. Pushed for strong action against global outlaw North Korea and its development of nuclear weapons. Announced a new Afghanistan strategy that strengthens support for U.S. forces at war with terrorism. NATO increased support for the war in Afghanistan. Approved a new Iran strategy plan focused on neutralizing the country’s influence in the region. Ordered missile strikes against a Syrian airbase used in a chemical weapons attack. Prevented subsequent chemical attacks by announcing a plan to detect them better and warned of future strikes if they were used. Ordered new sanctions on the dictatorship in Venezuela. Trump won the release of Americans held abroad, often using his personal relationships with world leaders. Made good on a campaign promise to recognize Jerusalem as the capital of Israel. Conducted a historic 12-day trip through Asia, winning new cooperative deals. On the trip, he attended three regional summits to promote American interests. He traveled to the Middle East and Europe to build new relationships with leaders. Traveled to Poland and on to German for the G-20 meeting where he pushed again for funding of women entrepreneurs. Author ResolvePosted on December 22, 2017 Categories Drain The Swamp, Tax Reform, Trump PresidencyTags Donald Trump, Immigration, Regulatory overhauls, Tax ReformLeave a comment on Tired of winning yet? The markets referred to daily in the financial press are composed of Wall Street trading on regulated stock exchanges, less formal Over the Counter (NASDAQ) markets, organized commodity exchanges worldwide, and specialized trading in major financial centers across the globe. Old timers often refer to price reporting as “the tape”, a reference to a 19th century telegraphic system that reported individual security transactions. By extension, one “fighting the tape” meant going against factual trends (i.e., the markets are poised to remain positive) because he presumes to be better informed. This also would be known as a contrarian. In a vast industrial sector, price levels are indicative of anticipated corporate performance. Recent markets that have risen to record breaking levels have given huge thumbs up to GOP economics and the leadership of President Donald J. Trump. High speed electronic data transfers have sent Edison’s ticker tape to museums. Modern trading desks are where authority to assume billions of dollars of risk is granted to alert young people who may not have reached their 30th birthdays. Many believe the free market performance in a competitive marketplace driven by perfect competition is the most reliable indicator of future pricing of equities and commodities. Perfect competition is defined as the situation prevailing in a market in which buyers and sellers are so numerous and well informed that all elements of monopoly are absent, and the market price of a commodity is beyond the control of any single individual buyer or seller. It is a classical economic theory. The world’s trading in wheat, crude oil, strategic metals and international markets for a nation’s currency, provide spot pricing (today) or a fixed future price defined by delivery at distant point of time. A user of cotton, for example, will set his raw material cost by purchasing a given amount of the commodity at a fixed price for future delivery. Sellers of cotton, farmers for example, eliminate market risk by selling their anticipated production for future delivery. There are many investors who enter the market as speculators and their risk is their own capital based on an individual analysis of market conditions. Publicly traded stocks anticipate corporate earnings and dividends and a rising equity price indicates belief in an enterprise’s growth over time. Collective wisdom, many economists believe, has a superior predictive capability. So, today’s “tape” is saying that tax reductions, less regulation and decentralization of decision making is good for most Americans. Anticipated growth seems to be a more laudable goal than redistribution, espoused by the left. Let’s turn to the anti-Trump political climate that emanates from believers in progressivism. They believe so strongly in government control they are unrealistic in their analysis of public data. They are fighting the tape. The Trump assertive leadership, while something new to Washington, has found favor among Americans. Wall Street performance says so and all the tales of gloom and doom from the disciples of the FDR New Deal and the Johnson Great Society are clearly backward looking using faulty economic logic. Similarly flawed logic was expressed, ahead of Trump’s election, by Pulitzer Prize-winning New York Times columnist Paul Krugman, who predicted that a Trump victory would trigger an economic collapse from which the United States might never recover. Current Democrat party leadership has adopted a policy they have called “The Resistance.” This is proving to be not very useful thinking to combat international threats stirring in North Korea and Iran to world peace and prosperity. It is a policy risk that is devoid of constructive thinking at a time when it may be clear to voters that policy changes are urgently needed. The party of Sen. Chuck Schumer (D-NY), California Gov. Jerry Brown, and Rep. Nancy Pelosi (D-CA) is not the party of FDR, Kennedy, or even Barack Obama. It offers no ideas about production and preaches consumption with fairness predicated on a system that buries individual responsibility. American success is due to creative individuals who shoulder responsibility, show up on time and take pride in a job well done. Collective performance leads to collective prosperity. Yet the Democrat Party continues fighting the tape. – Walter B. Bull, Jr.
As gridlock rages on in Washington, we are discovering that the shared commitment by Moore County Republicans to pursuing security, opportunity, liberty and victory is not always embraced by lawmakers. This only has become magnified in the age of Trump as Republicans in Congress seem paralyzed by the power they wield as the majority party. It seems inexplicable that Obamacare has not been dismantled or that meaningful tax cutting is proving to be an excruciating legislative chore (even though Republicans were elected by voters who name these as priorities). As it turns out, there is an obvious explanation. It is proffered by North Carolinian and veteran political analyst John Davis, keeper of The John Davis Report. Congressional leaders take heed: Every despicable, incompetent, crude, insulting, immature, reckless, irresponsible and insensitive thing that (President) Trump has ever said or done COMBINED, is not as bad in the minds of his supporters as a do-nothing federal government rigged for the privileged few. President Trump will continue to make fools of U.S. Senate and House leaders who continue to protect the swamp, who put the moral high ground of the way things have always been done ahead of getting things done. Those who value civility over outrage. The mainstream media, Democrats and even some centrist Republicans remain in a constant state of despair about Trump, his candor and his Tweets. He is not “presidential” enough. Precisely, notes Davis. If we want to see “the swamp” drained, you don’t do it with a Jeb Bush or a John Kasich. He further cites the recent showdown between Tennessee Sen. Bob Corker, a Republican, and Trump. The President views Corker as just another entrenched swamp creature, even though Washington conventional wisdom would dictate that Trump avoid skirmishing with the chairman of the Senate’s Foreign Relations Committee. That’s it for Corker. He is now in the Trump trap. The latest Republican on a long list to fall prey to Trump’s ploy of needling his opponents into the tangled web of reactionary vindictiveness. At their peril, DC swamp politicians continue to miscalculate the political consequences of demeaning Trump as an individual, or diminishing Trump’s presidency through inaction. Trump’s approval rating is below 40% but he remains a rock star in contrast to tepid Congressional approval numbers. Davis observes that they apparently fail to see what is coming in 2018, a tidal wave of dissatisfaction. Unfortunately for establishment Republicans, the voter outrage that propelled unpresidential Donald Trump past their hand-picked candidates for president is now being redirected against US Senate and House Republican incumbents in next year’s GOP primaries. In today’s political environment, the establishment is the kiss of death. A Fox News Channel commentator cleverly selected a golf reference to describe the impact of President Donald Trump’s October 12 executive order on a law bearing a famously disingenuous name, the Affordable Care Act. Harris Faulkner said Trump’s order will “take a divot” out of the law, a.k.a., Obamacare. By Walter B. Bull Jr.
Before the analysis of President Trump’s September 19 address to the United Nations is compartmentalized by liberal and conservative writers, I would like to put forth my unvarnished opinion. President Donald Trump is an unconventional president. He does things that even some of his supporters don’t like. However, it pays to remember that’s why we elected him in the first place. Our country is facing huge challenges and conventional, establishment politicians haven’t gotten the job done. Change is needed. Republican Party of Moore Co.